MOULDINGS, the term in architecture for the decorative treatment given to projecting or receding features in stone, wood and other materials, by means of curved forms, whereby those features are accentuated and varied owing to the play of light and shade on the surfaces. The principal characteristics of all the European styles are to be found in the mouldings employed in them and in their ornamental decoration. In some of the earlier styles, such as the Assyrian and The Persian, there are no mouldings: coloured bands in brick, enamelled tiles or beton, were deemed sufficient to mark the divisions of their storeys or to decorate their buildings. The Egyptians employed two mouldings only, the cavetto (fig. I), a deep moulding some�times of great dimensions which crowned their pylons, temples and decorative shrines, and the torus, a semicircular projecting moulding which was carried above the architrave and down the quoins of their buildings. The Greeks were the first to recognize, in their temples, the special value possessed by mouldings which, occupying an intermediate position between the ornamental sculptures and the simple architectural lines of the main structure, gave a richly decorative effect to the latter without interference with the beauty of the former. The Classic mouldings may be divided into two classes, simple and compound; to the former belong the cavetto (of small dimensions when compared with the Egyptian cavetto) and the Scotia (fig. 2), employed for the bases of columns, which are seen below the eye, both concave mouldings, whilst the ovolo or echinus�Fr. ore or quart de rand�(figs. 3 and 4) and the torus are convex mouldings. The compound mouldings are those composed of curves of contrary flexure, such as the cymarecta or cymatium (fig. 5), of which the upper part is concave and the lower convex, a moulding constantly employed for the upper member of the cornice, and the cyma-reversa or ogee (fig. 6)�Fr. talon�in which the upper portion is convex. The Greeks sometimes varied the ogee moulding, the upper portion of which is turned back and the lower portion brought forward, and to this the term quirked ogee (fig. 7) is given. Another Greek moulding of compound form is the bird's beak (fig. 8), employed as a drip moulding above the corona. Of smaller dimensions is the astra�gal (fig. 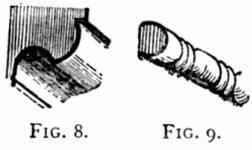 9), a moulding invariably carved with the bead and reel, -which in Greek work is constantly used in conjunction with the en�riched echinus and cyma-reversa mouldings (figs. 18, 20) and below the necking of Ionic capitals; and the listel or fillet, employed chiefly in the separation of curved mouldings one from the other; in the cymatium constituting its upper termination (fig. 5), and in the Scotia (fig. 2) its upper and lower border. In Classic work generally the cavetto is only employed for the apophyge under the capital and over the base, but in Roman work, as in the theatre of Marcellus, it sometimes took the place of the cymatium of the cornice. Although extremely simple in its form, the finest Greek moulding, and the one to which the Greeks apparently attached the greatest value, was the echinus under the abacus of the Doric capital. The earliest archaic example exists in the capital of the shafts flanking the tomb of Agamemnon at Mycenae (a, fig. 10), where it consisted of a large torus decorated with the chevron (see CAPITALS), and an apophyge carved with the petals of a flower; a similar decoration of the apophyge is found in two or three early Doric capitals, as at Paestum and Metapontum, but this is the only example known in which the echinus of the Doric capital was carved, though traces of painting and gilding have been found on them. Other examples showing the gradual development of the echinus are shown in fig. 10; b being from the temple at Corinth, c from the Parthenon at Athens, d from the portico at Delos, e an early Roman example (c. 60 b.c.) of the temple at Cori, and f from the theatre of Marcellus, where it nearly approaches the quarter round always employed in late Roman work and in the Renaissance. There is one other important decorative feature which forms the most characteristic feature of the bedmould of the Ionic cornice, viz. the dentil cornice (fig. 11), derived originally from the ends of the squared timbers which carried the cornice of the primitive Ionic temple, and in the earlier stone examples copied more or less literally; it subsequently in the 4th century was introduced as a part of the bedmould of the cornice of the Ionic Order, the temple of Minerva Polias at Priene in Asia Minor being one of the best examples. It consists of a series of projecting blocks with intervals between them equal to half the width of the block. In the Greek Corinthian Order it was first introduced into the Choragic monument of Lysicrates. It was constantly employed by the Romans in their temples of the Ionic and Corinthian Orders, the finest example being in the bedmould of the temple of Castor in Rome, where it is twice the height of the other mouldings. In the Romanesque style the mouldings consist almost entirely of rounds and hollows, the former known as the bowtel and in England, France, Spain and Germany employed to decorate or soften the angle of an arch mould. As the Roman�esque arch frequently consisted of two or more rings of arches, projecting one in front of the other, to which rings the term " order " is sometimes given, the repetition of this simple moulding constituted an ample decoration by itself, but in the Norman work in England and the north of France there is found the constant recurrence of mouldings broken into zigzag lines and other decorations coming under the head of orna�mental mouldings described below. The simple bowtel (fig. 12) was retained in France far into the Gothic period, but in the Early English style the mouldings (fig. 13) became lighter, being more boldly cut than in the Romanesque styles. Here again, as in the earlier style, each ring or order is enriched with a succession of alternate rounds and hollows, the latter very deeply cut, and a few small fillets. The bowtel also is brought cut to an angle which is sometimes emphasized by a small fillet; this is sometimes called the keel moulding from its re�semblance in section to the bottom of a ship. 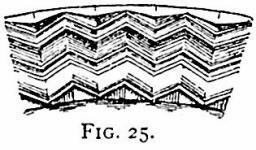 Sometimes the angle of the ring is splayed, and the mouldings are worked on the splay, and this is very often found in the mouldings of the ribs of a vault (fig. 13a, giving greater lightness to the rib. The mouldings of the Decorated period (fig. 14) are more diversified than those of the Early English, and the hollows towards the end of the period become shallower and broader, ogees being frequently employed. One of the chief characteristics of the Perpendicular period (fig. 15) is the prevalence of large shallow hollows and the employment of two ogees in close contact with the convex sides next each other. The French mouldings of the Gothic period in Normandy and adjacent parts follow very much on the same lines as those in England, but in the south of France and in Germany they are very much simpler, and one rarely finds the deep hollow which forms the chief characteristic of English mouldings. In French flamboyant and late German Gothic work the mouldings run through, penetrating one another; these in Germany were sometimes cut off, having the appearance of the smaller stems of a tree from which some of the boughs have been lopped. 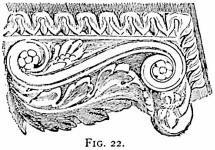 Ornamental Mouldings.�Although the mouldings in Greek and Roman architectural works are in general form much the same, they vary materially in their profiles and also in the refinement of their enrichment with carving. It is probable that the earliest decoration of mouldings was confined to the painting only of their surfaces, and in one or two of the more archaic examples traces of painting only are found on them. The desire to accentuate the ornament would seem to have led the Greeks at a very early date to incise or raise in relief the decorative designs which originally were painted only; at first this was done very sparingly, and in the earlier buildings but few mouldings were employed; in course of time they increased in number, and in the Augustan period in Rome the carving extended to the flat surfaces of the corona, and the fascia and soffits of the architrave. The four principal Classic mouldings, so far as their enrichment with carving is concerned, were the cyma-recta or cymatium; the cyma-reversa or ogee; the echinus or ovolo; and the torus. The cymatium was almost always decorated with a conventional treatment of the flower of the acanthus plant, known generally as the anthemion and sometimes as the honeysuckle; the finest example is that which is found in the cornice of the north doorway of the Erechtheum (fig. 16). Although in some cases the flower of the acanthus is repeated in the Roman cymatium, the rigidity of the other lines does not seem to have appealed to the Roman sculptor, who preferred more foliage, such as is shown in the cymatium of the Forum of Nerva (fig. 17), there being endless variety of design in Roman examples. The ogee-moulding in Greek work was always carved (fig. 18) with the Lesbian leaf (Fr. rais-de-coeur; Ger. Herzlaub), which in Roman work received a peculiar interpretation of the original design; not understanding the modelling of the leaf and requiring a deeper shadow, the Roman drilled holes in it and evolved another composition of two leaves, so that the outer edge of the Lesbian leaf formed a trefoil cusp (Fr. talon tr�fl�), constituting a new description of border, as shown in fig. 19, from the temple of Castor at Rome. there being always two beads and four reels to each leaf or egg. 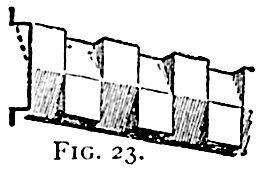 When employed as the crowning moulding of an architrave, the ogee is always capped by a fillet; and the same applies to the cymatium of the cornice. When the ogee moulding was of small size and employed in a subordinate position, as is constantly done in Roman work, crowning the modillion or subdividing the fascia of the architrave, a simpler leaf pattern was employed. Though not a moulding, the modillion, which was invented ented by the Romans to give additional support to the corona, forms part of the bedmould of the cornice, and may therefore be described here. 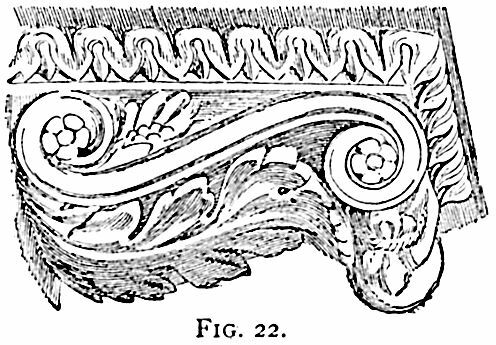 It consists of a small bracket (fig.22), design of which was probably derived from the vertical console bracket which carried the cornice of the Greek doorways, but which in the Roman cornice was employed horizontally. The design of the outer side is that of an Ionic volute with its cushion; on the inner side the volute is reversed and is of greater size, the soffit being masked by a leaf. The torus moulding of the base in early examples was fluted luted but not carved, and the earliest example so treated is that found in the base of the columns of the Erechtheum, where it was enriched with the triple guilloche. In the temple of Apollo Branchidae, near Miletus in Asia Minor, where they would seem to have attempted to rival the figure decoration of the temple of Diana at Ephesus, the torus mouldings were elaborately carved with the acanthus plant and the laurel leaf; but it was in the Augustan age in Rome that the greatest elaboration was given to the torus of the base; in the Ara Pacis, set up in A.D. 13, it was carved with the double guilloche; the finest Roman example of an enriched torus being that of the base of the Trajan column in Rome, which is carved with laurel leaves tied at intervals with bands. The principal enriched Byzantine moulding is that known as the Venetian dentil (fig. 23), in consequence of its constant employment in Venice and the towns in its vicinity. Its earliest appearance, however, is in Sta Sophia at Constantinople (A.D. 537). The other carved Byzantine mouldings are those which throughout Syria form richly carved string-courses, taking the place of the Classic cornice, and the hood moulds of arches. The Byzantine stringcourse, which is found in St Mark's, Venice, and in most of the towns bordering on the Adriatic, is a cyma-recta carved with the acanthus leaf. The enrichments of the mouldings of the Romanesque style are of great variety; in parts of Italy and in the south of France they were largely influenced by Byzantine work; but in Sicily, Apulia, Normandy and England the Normans introduced a series of purely geometrical forms in which the chief peculiarity is the rare occurrence of foliage. The most characteristic example is that of the zigzag or chevron (figs. 24, 25), of which there are many varieties; then follow the single and double billet (fig. 26), the double cube, the indented, the beakhead (fig.27), &c. In the transition period in England, flowers and foliage begin to be introduced, and the rosette (fig. 28), the dog-tooth (fig. 29), which develops into a four-leaf flower, and the ball flower (fig. 30) follow, these being all carved in the hollow of cavetto mouldings. In the Decorated and Perpendicular styles, the flowers and foliage introduced in mouldings become more natural, till one reaches the Tudor rose (fig. 31), a precise copy of the flower, beyond which it was difficult to go.